We’d love your help. 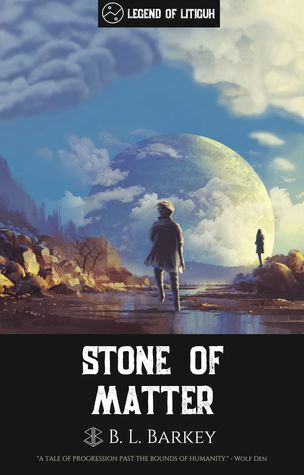 Let us know what’s wrong with this preview of Stone of Matter by B.L. Barkey. Titans wage war over the Creation Stones, seeking the final hidden Stone of Matter. Revealing glimpses of the Greater War. Ammon walks through dreams, witnessing the powers of light and dark. After experiencing the true nature of these Stones, he must choose which paths he will tread. And only one thing remains clear. The world of Proelum, and life as they know it, is abou Titans wage war over the Creation Stones, seeking the final hidden Stone of Matter. Revealing glimpses of the Greater War. Ammon walks through dreams, witnessing the powers of light and dark. After experiencing the true nature of these Stones, he must choose which paths he will tread. And only one thing remains clear. The world of Proelum, and life as they know it, is about to change. Perhaps for the last time. To ask other readers questions about Stone of Matter, please sign up. I had a really fun time with this read, the characters were dynamic and the world was unique, despite some predictable fantasy tropes, it never felt cliche. I think this series will be great. This is awesome for fans of large, high fantasy stories with its own world and system. B.L. BARKEY was born in Colorado Springs CO into a military family on 22 September 1990. He was raised with two families, his parents divorced and both remarried. This essentially meant two furnished bedrooms and two Christmases, so it wasn’t a bad gig. He has three siblings in either family, making him the eldest of seven children. He loves his family and strives to be an example to his six sibli B.L. BARKEY was born in Colorado Springs CO into a military family on 22 September 1990. He was raised with two families, his parents divorced and both remarried. This essentially meant two furnished bedrooms and two Christmases, so it wasn’t a bad gig. He has three siblings in either family, making him the eldest of seven children. He loves his family and strives to be an example to his six siblings. Both his families served our awesome country in the United States military. Throughout his childhood, he called many different places home, including Colorado, Illinois, Florida, Guam (still U.S. territory), North Dakota, Las Vegas Nevada, Idaho, Utah, California, New Jersey, Maryland, and Pennsylvania. He has recorded songs and lyrics of his own, and ran in multiple marathons, triathlons, duathlons, and shorter races. He ran the Boston Marathon in 2012 with a time of 3:03:00 in 103 degree-F weather. He completed his first full Ironman triathlon in July 2018. Also after high school, he attended Colorado State University to acquire two degrees in Civil Engineering (BS and MS). Soon after graduation in Dec 2015, he was hired with J-U-B ENGINEERS in Idaho, and then transferred to Utah.